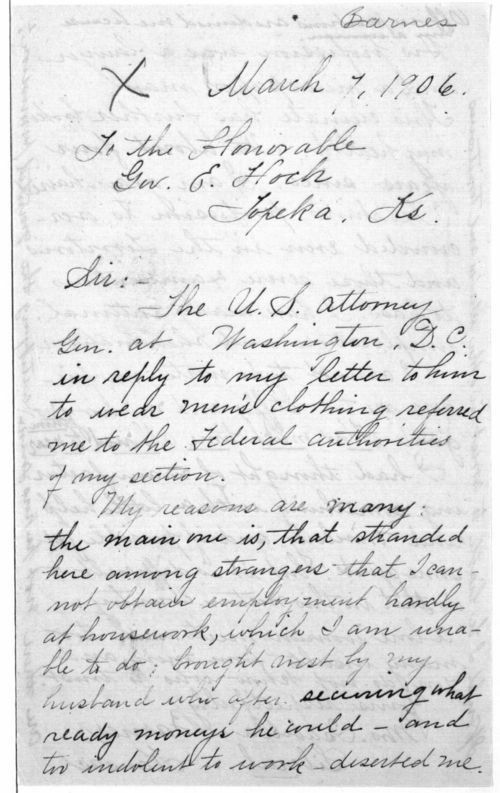 Mrs. Isabella Barnes of Liberal, Kansas, writes Governor Edward Hoch of Topeka concerning her wish to wear men's clothing. Mrs. Barnes states that she would like to wear men's clothing to help her obtain suitable employment and avoid unwanted insults from men. She has contacted the U. S. Attorney General at Washington D. C. concerning this issue and asks Governor Hoch if she would be liable to arrest and if there was not some way for a woman to receive permission to wear men's clothes. Isabella's concerns illustrate many women's efforts to transcend narrowly defined social and sexual roles in the early twentieth century.